It's been a mild day in the southern Rhône and a damp one, yet it's amazing how the best wines can dissolve the heaviest cloudbank, at least metaphorically. It's good to be back in Orange and, of course, to be exploring the wines of Châteauneuf. For me, this is the most enjoyable buying trip of the year. Yes, I love the wines of Burgundy, but a week in the region in the armpit of winter is time spent in a dead and seasonally barren landscape. Without the wine the days could become a little bleak if not downright depressing. Down here, however, three-or-so hours by car to the south, the air is soft and even a damp landscape displays signs of life and offers a hint of the incipient spring. How better to start the day than with a visit to Isobel Ferrando at the Domaine Saint Préfert? Mme Ferrando is so welcoming and enthuses so readily about her vineyards and the wines she makes there from, it's impossible not to get caught up in the mood. Her wines have the power to lift that mood yet further! We started with a tasting of several cuvées of 2008. It was a tricky vintage. The weather threw hail and one period of high precipitation at wine growers, yet something well worthwhile has been produced. A cuvée of Grenache was followed by one of old vine Cinsault and, lastly, a barrel of Syrah was sampled. All these cuvées are destined for the Réserve Auguste Favier. These are crisp wines, with good fruit. One won't have to wait too long to drink these '08s, I think. Isobel's 2007 are beautifully pure. As with many of the wines we have tasted today, the fruit has a coolness that belies the lofty alcohol content; a creaminess and freshness that suggest they'll drink quite early, but hold into the long term. The white wine here is a bonus. It is utterly beguiling. From Saint Préfert, we made our way to Clos des Papes and a meeting with Vincent Avril. Vincent's mother is bourguignonne and he studied wine making in Beaune. It is sometimes suggested that Vincent's wine reflects his love of the wines of Burgundy and yes, it shows an elegance and equilibrium that other Châteauneuf producers struggle to equal. It's a marathon tasting here. The wine has yet to be assembled, so we taste from 6 large foudres - barrels of up to 6,000 litres - the components of the wine that will eventually be bottled as 2007 Clos des Papes. None is less that mind-blowing: linear, controlled, intense mouthfuls of ripe, fresh fruit. One can see why the vignerons themselves are rather in awe of 2007. Most have never seen a vintage like it. 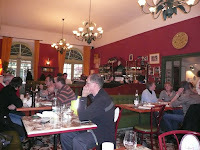 Lunch was scoffed with alacrity in Mère Germaine, a great bistro in the centre of Châteauneuf. We had been so long enjoying M Avril's hospitality that we hadn't long until our next appointment. At Domaine Giraud, Marie Giraud's wine making soars to greater and greater heights. The "basic" cuvée of 2007 Châteauneuf is pure Châteauneuf cream; perhaps lacking a little in acidity, but for drinking in the next five years, it will be an early demonstration of the profound charms of this harvest. There are two senior cuvées made here: Les Gallimardes, from a vineyard of that name that lies to the south of the town, and Grenache de Pierre: a mono-varietal named for Marie's father. Both are quite delicious in '07: mineral, structured and, most importantly, delicious. Last stop of the day, we headed up to the Domaine Pierre Usseglio to meet Thierry, son of Pierre and wine maker here. In the garden of the domaine is a pond populated by exotic waterfowl of many kinds - mandarin, wood and pintail ducks - and surrounded by various scavenging chickens. This is now one of the senior estates in this large appellation. Thierry's wine become increasingly complex and intense with every vintage and what an extraordinary vintage 2007 is for Thierry to show of his considerable talents. There are three red cuvées here that range from extremely fine to well off the chart and up the wall.